If you need a short telephoto lens on the X5 and X5R, then this is the lens for you. It's equally effective for aerial footage on the Inspire or ground shots from the Osmo. The M-Zuiko 45mm prime lens is produced by Olympus as a premium Micro Four Thirds lens and will fit the DJI X5 series cameras perfectly. 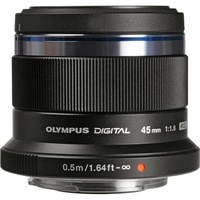 The 45mm focal length is the equivalent of a 90mm telephoto lens on a full-frame sensor. The fast F1.8 wide aperture will stop right down to F22, giving a great range from low light scenes to very brightly lit scenes. Compared to the 72 degree Field Of View of the standard DJI lens, the 45mm offers a 27 degree FOV which will deliver considerable control over depth of field, enabling an impressive separation between a focused foreground and a beautifully defocused background for a genuinely cinematic look. For that reason, it's the ideal lens to emphasise your subject. Constructed with 9 elements, it will focus from 50cm to infinity with fully electronic aperture control. The Movie-Still-Compatible (MSC) mechanism provides a quick and silent focus mechanism both for movies and still photography. On the X5 or X5R camera, this metal-bodied lens will deliver sharp and crystal-clear images over the entire image area. To ensure clear imaging performance even under unfavourable conditions, such as when shooting against the sun, the lens surfaces are coated with ZERO Coating, minimising issues with ghosting and flare. 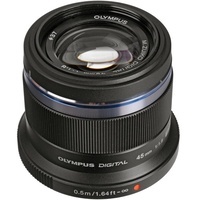 The Olympus 45mm prime lens weighs 116gm and will accept 37mm filters. 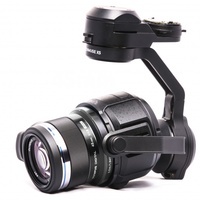 The DJI Balancing Ring should be used with this lens. To explore it fully, bring your X5 or X5R camera into Camzilla for a free test drive of this impressive lens.